Jane Grant, neural noise, ghosts. I’ve recently had the extreme good fortune of corresponding with Jane Grant. Some of her work can be seen here, here and here. Really great stuff. Between signal and noise is a space between something but not nothing. The signal to noise ratio is a measure of desire and its opposite. The signal, clean, clear and crisp speaks of precision, of information transferred, understood and explicit. Noise however is its chaotic partner, an undercurrent of information, not yet formed, mutable and implicit. Signals are measured, removed of noise, their code, employed and translated as information, as the opposite of nothing, or nothing structured enough to be factored in. The signal must be a singular stream, a positive, the binary 1 to noise’s 0. And yet it appears that noise is the underlying endogenous stimulation of the brain and many other biological systems. Sensory neurons are extremely noisy. Between the signal and noise are the ghosts of memories resonating, coming into being, aside and between sensory information, they are implicit, felt, ripples of affect, oscillating at frequencies both endogenous and exogenous. This comes in a discussion of Grant’s work “Ghost” at the Instanbul ISEA 2011. It’s a fascinating work that really lays out some of the things that have been working my mind for a while in relation to the link between spectrailty horror and noise, but it adds a really complex neuronal aspect to the argument. For me the link comes precisely because noise evades our taxonomic categories, it prevents us from being able to entertain a transcendent relation to something in which things would be “in their place”. Where i perhaps differ from many people is in thinking that this doesn’t necessarily mean that it’s “chaotic”. I think that the idea of noise only as some kind of anarchic, chaotic force has led people down the wrong garden path for quite some time. I think on the contrary, as I see Jane doing here, that it’s both the background out of which things are formed, and everything, not just sound, but at the same time it is carried into those forms as they start to take shape. This is not to say that noise becomes signal, though, rather that signal contains noise within it, can never actually separate itself off from the plane of noise out of which it is born, and that what the trace of noise talks to us of is precisely the process of formation, of forming, of figuration that takes place in any deployment of an expression (i.e. everything if ontology is expressive). So following Jane’s lead here… what if the whole idea of a ghost, linked to memory, might in fact be a noisy manifestation of the brain’s own processes. In other words, what happens (and i profess to be very far from qualified to answer this question) when the brain’s processes and operations are deployed / experienced without one being aware of the manifest content of the thought process in place. Can one be aware of a brain activity that isn’t sublimated underneath a representation of some THING, of the contents of thought, underneath something that we could actually call a thought? In relation to music, for instance, I would say that noise is not just the Futurists and John Cage, but rather noise is present in all music but we often don’t hear it because precisely we adopt a transcendent relation to other parts of music, to melody for instance that leads us to believe that a line just had to be that way, but of course it doesn’t, any musical line is just an arbitrary collection of different sonic intensities that seem to fall into a necessary order because of a long process of cultural over coding and habitus of listening. And so perhaps with thought. We are used to having ‘thoughts’, and to thinking through what they seem to be telling us; but what if one doesn’t concentrate on what they are telling us but on the telling, they would be manifesting themselves in far stranger ways, they would be like your ghost i imagine, at a cerebral level, a kind of semi-formed body without a body, something that seems to have some distinguishable contours yet which evades us. And herein would be perhaps a link to the art of listening. 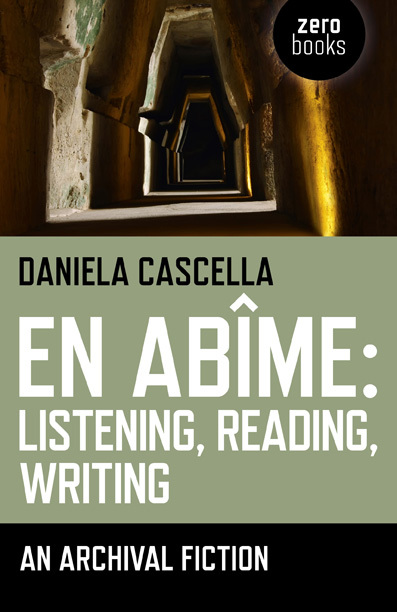 Must get my hands on Daniela Cascela’s new book. 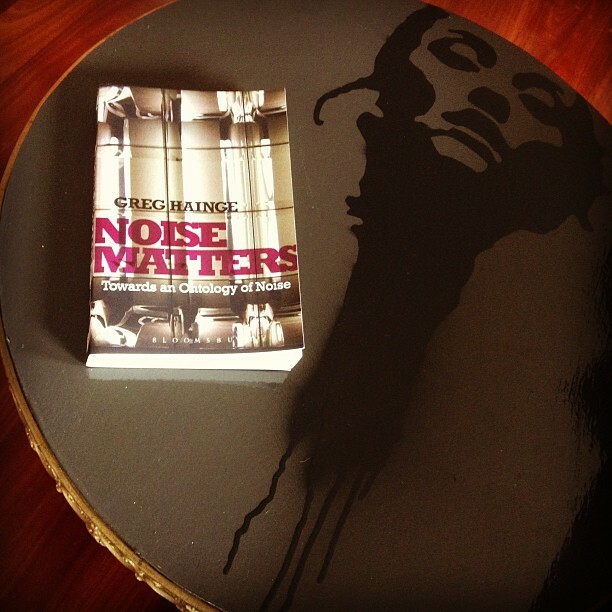 Coffee table book (with apologies to Converge’s Jane Doe). This has been a long time coming. Both this book and the blog. But here is the book in physical form. On a coffee table to boot. As if to prove the point. And here I am writing the blog. If these things are appearing at the same time, it’s because with the end of one project comes the start of another, and I’m hoping here to externalise some of that process. Already, before the UK publication date of this book, I find myself disagreeing with myself in another paper I’m writing on the ontology of music. More on that soon. At times like these, let beauty strengthen our resolve. MEUTRIÈRE. Text by Manuela Morgaine. Translation by Greg Hainge. David Lynch, Idem Paris and the genesis of the (screened) image. Capitalism and Schizophrenia in Celine.